Both of these sides won in the opening week of Group G in the EuroCup so we should have a match between two sides with a great deal of confidence. 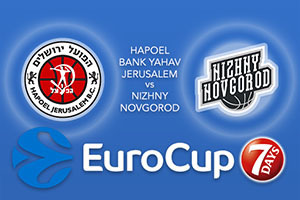 These two sides have clashed on five occasions in this tournament and the lead lies with Nizhny who have triumphed three times to the single victory of Hapoel. Both teams enjoyed an up and down time in the regular season but with one team set to take a 2-0 record at the start of the Top 16, this is likely to be a big match this midweek. Hapoel were victorious in Lithuania last week and this will provide them with a good starting for this game. The hosts have a strong defence and that is something that they will look to utilise in this clash. One player that has been a key player for the Israeli side so far this season has been Curtis Jerrells who has provided an average of 18.1 points per game. There has also been strong support from Jerome Dyson, who has offered an average of 12.6 points per game while Amare Stoudemire has provided an average of 10.2 points per game while also offering an average of 5.9 rebounds per game. For Nizhny, last week’s home win over Zenit St Petersburg was a great start to the Top 16 in this year’s EuroCup and they’ll be determined to get something from this road trip. DeAndre Kane was the MVP in Round 1 of the EuroCup and he’ll look to improve on his average of 17.6 points per game while also grabbing an average of 7.8 rebounds per game and 4 assists per match. This is an impressive run of statistics but Kane hasn’t been doing things by himself, there has also been support from Ivan Strebkov, with an average of 17.1 points per game and Kenneth Boynton has chipped in with an average of 14.1 points per game. The bookies make the hosts clear favourites for this game, so take Nizhny Novgorod at +9 at odds of 1.90. If you’re looking for the Over/Under market, choose to go OVER 169.0 at odds of 1.90. Bet Now!